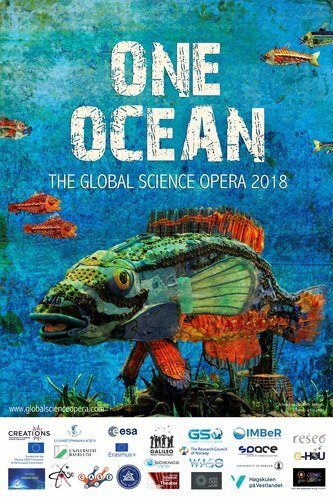 One Ocean is the fourth Global Science Opera, and the first with a focus on the marine environment - having as its theme The ocean, sustainability and climate change. It has involved school pupils, university students, scientists, teachers and artists from more than 20 countries, who have worked to simultaneously create performances about the interactions between humans and the oceans. Pollution is one of the challenges facing the oceans that is highlighted by the opera. Because it is a universal problem that does not respect national borders, it will take a global collaborative effort to deal with this challenge. With this in mind and knowing that about eight million metric tons of plastic waste enter the world´s oceans every year, GSO 2018 incorporated eco-design aspects to raise the awareness of all involved. Several of the countries utilised recycled plastic waste to create the costumes and sets for their segments of the GSO. Eco-design forms a bridge between science and art, requiring knowledge of both fields to achieve a successful design. The One Ocean Global Science Opera was developed in collaboration with IMBeR.